Lauren James has done it again, she has written another amazing book that will have you on the edge of your seat and enjoying every minute of it. When I read The Loneliest Girl in the Universe a couple of years back I immediate fell in love with the story, the writing, the characters, the entire book was amazing. So I sort of knew what I was in for when I started The Quiet at the End of the World but still I ended up enjoying it so much more than I thought I would have. Once I started reading I literally couldn’t put the book down because I had to know what was going to happen next, and before I know it I’m at the end of the book. In 2024 the entire population of the world was infected with a virus that made everyone infertile, and the only way to carry on the human population was to use eggs that were frozen at fertility clinics. Now in 2109 the youngest humans left on earth are teenagers Lowrie and Shen. All the remaining humans have set up home in central London to form their own small family and to protect Lowrie and Shen. Problems start when the two teenagers are nearly killed when a plane crashes into Big Ben because the pilot suffers some sort of seizure. But when other people in London also start having the same seizure, Lowrie and Shen have to work out what is happening before all of humanity including themselves are wiped out from earth completely. I thought the story was very original and very thought provoking. Throughout the book I was thinking this could actually happen then I was asking myself what would I do if I was in this situation. I’ve not read a story like this before but the way Lauren James has described it does make it seem like this could really happen in the not too distant future. As well as some very clever storytelling there is some really clever twists dotted throughout the book. I think this is one of the reasons why I couldn’t put the book down because every other chapter something unexpected would happen and it would throw out everything you thought would happen by the end. I’ve only read two books by Lauren James but both of them books have the same sort of style where she will grab your attention from the very start and then she will hold onto that attention with the gripping storytelling and wonderful character development until you’ve read the very last word. For me a sign of a good book is when you cant put the book down, and I just couldn’t stop reading this once I started. I sat in my chair reading it from cover to cover in just a few hours. Every time I thought I was going to stop reading at the end of a certain chapter I couldn’t because something happened and made me want to continue. Luckily the book wasn’t longer or I might have been late for work! 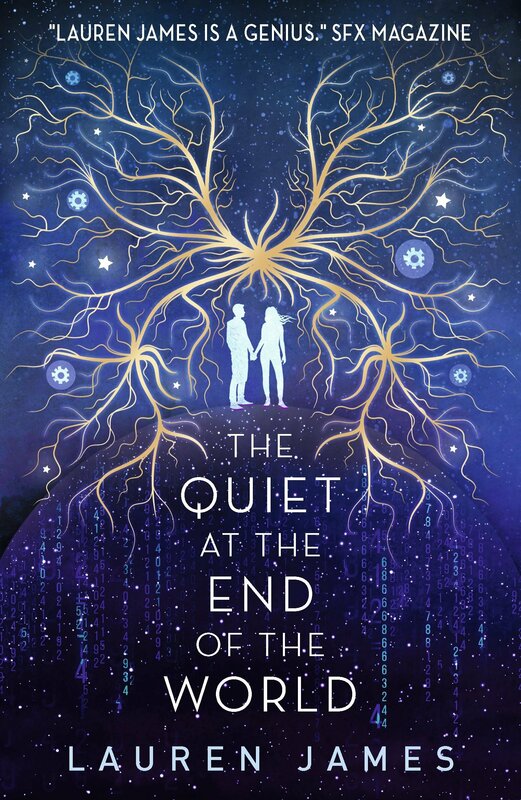 I could not recommend this book enough, if you are looking for a read that will have you glued to your seat and leave you breathless with all the twists and turns then you should definitely pick up The Quiet at the End of the world, you will not be disappointed. This book had my laughing, crying, left me speechless and made me think about the world we live in today. The Quiet at the End of the World has not only made it onto my favourite reads of 2019 but it has also made it onto my favourite reads of all time.